This online course describes some basic protocols in using the personal RITM SCENAR device for use in Equine SCENAR treatment. The RITM SCENAR devices can be used by horse owners, vets, trainers, riders working in competition or for leisure as well as in special veterinary clinics, stables, race tracks etc. 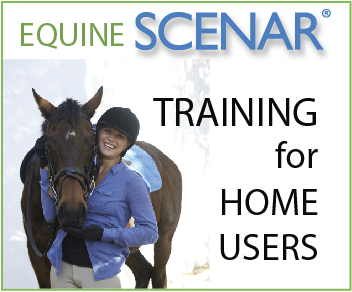 This Equine SCENAR Home User online training is designed specifically for the personal SCENAR devices. In times when It is not always possible to consult with a highly professional vet, as a Home User of the RITM SCENAR personal device we can apply a universal approach to some veterinary issues with prompt therapeutic results at any stage of dis-ease and dysfunction. The RITM SCENAR device results in pain elimination, blood flow improvement and normalisation of nervous, hormonal and immune systems. For those wanting to practice and specialise in Equine SCENAR Therapy, RITM AUSTRALIA offers a Professional training course with case study submissions that will be required to become accredited practitioners. Please note that differing SCENAR models will have different functions – every effort is made to update this manual as soon as devices are upgraded and or changed. RITM Australia Pty Ltd and Vera Payne reserve the right to alter this manual at their discretion.